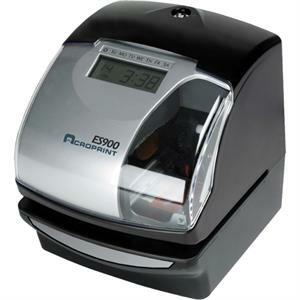 The ES900 time clock can be used to support time and attendance, job costing and document control and is designed for a professional office environment. This time recorder synchronizes automatically with time codes transmitted by the National Institute of Standards and Technology, keeping it incredibly accurate. The internal battery backup keeps the clock on time, even during power outages. Add an optional NiCd battery, and you can keep using the ES900 even when the power is out. Over 300 print configurations and 13 preset messages (RCVD, SENT, IN, OUT, CFMD, FILED, PAID, USED, FAXED, VOID, ORIGIN, APR'D, CMPL'D). Can be programmed to do consecutive numbering (up to eight digits with up to nine repeats). Choice of English, Spanish, German, French, Italian, or Portuguese. Dimensions: 7.13" x 6.14" x 6.97"